Arthur Martin Lamb was born on 27 September 1917 in Pennsylvania. He married Jane Ursula Oehler, daughter of Arthur Oscar Oehler and Louise Hoffman, on 29 November 1941 in Buffalo, Erie County, New York, at Central Park Methodist Church, with the Rev. Dr. Henry Irving Rasmus, Jr., officiating. The following appeared on 1 December 1941 in the Buffalo Courier-Express: The marriage of Miss Jane Ursula Oehler, daughter of Arthur O. Oehler of Northrup Place, and Arthur Martin Lamb, son of Olivewr E. Lamb of Corning, was solemnized at 3 o'clock Saturday afternoon in the Central Park Methodist Church. Dr. H. I. Rasmus officiated. The bride wore a princess gown of white slipper satin fashioned with a sweetheart neckline and her headdress of orange blossoms held in place a finger tip veil. She carried a bouquet of chrysanthemums. Mrs. Herman J. Lips of Yonkers was matron of honor for her sister and was gowned in cornflower blue taffeta with which she wore a matching tiara and veil. Mrs. Irving Oehler and Mrs. James Rose of Albany, a sister of the bridegroom, were bridesmaids. They were attired in coral taffeta costumes and carried yellow chrysanthemums and pompons. Donald M. Hubbard attended the bridegroom and Mr. Rose, Howard Cole of Corning, Courtland Harris and Mr. Lips ushered. A wedding reception was given at the home of the bride's brother in Winspear Avenue and a dinner followed at Kathryn Lawrence Dining Room. After December 15th, Mr. and Mrs. Lamb will reside in Corning. The following appeared on 1 December 1941 in The Evening Leader: Miss Jane U. Oehler, daughter of Arthur O. Oehler of Northrup Place, Buffalo, and Arthur M. Lamb, son of Oliver E. Lamb of 274 Bridge street, Corning, were united in marriage Saturday at 3 p. m. at Central Park Methodist Church, Buffalo, by the Rev. Dr. Henry Irving Rasmus, Jr. The bride was gowned in white slipper satin, princess style with sweetheart neckline. She wore a fingertip veil, and a tiara of orange blossoms. Her shower bouquet was of chrysanthemums and pompons. Mrs. Herman J. Lips of Yonkers, was her sister's matron of honor, wearing cornflower blue taffeta and matching tiara and veil, and carrying yellow chrysanthemums and pompons. The bridesmaids, Mrs. Irving A. Oehler of Buffalo, sister-in-law of the bride, and Mrs. James Rose of Albany, sister of the bridegroom, wore coral taffeta, with matching tiara and veil, and carried pompons. Donald M. Hubbard of Port leaden was best man, and ushers were Herman J. Lips of Yonkers, James Rose of Albany, Howard Cole of Corning, and Cortland Harris of Lackawanna. Dinner followed at the Kathryn Lawrence, with a reception later at the home of the bride's brother, Irving Oehler, 553 Winspear avenue, Buffalo. Attending the ceremony from here [Corning] were: Oliver E. Lamb, Mrs. F. M. Lamb, Miss Eleanor Schoonover, Miss Grace Falk, Mr. and Mrs. Howard Cole. Miss Oehler, who has always lived in Buffalo, studied at the Buffalo Business School. Mr. Lamb is a graduate of Northside High School. After a year at Cornell University, he entered the University of Buffalo being graduated from the pharmacy course this year. A licensed pharmacist, he is assisting his father at Lamb's Pharmacy. The couple are now staying with O. E. Lamb, and will be at home after January 1 at 58 Wallace street. The following appeared on 26 December 1941 in The Evening Leader: Mr. and Mrs. Arthur M. Lamb, 58 Wallace street, spent Christmas in Buffalo with Mrs. Lamb's father, Arthur Oehler, and with her brother. The following appeared on 26 August 1943 in the Corning Leader: O. E. Lamb of 274 Bridge street has received word that his son, Arthur M. Lamb, has been promoted from Pharmacist's Mate third class to Pharmacist's Mate second class. Ph. M 2c Lamb is now stationed at the Coast Guard Base on Staten Island. He has previously been stationed in Detroit, Mich., and at Columbia University, New York City, where he took a three months' course, being graduated with honors. His wife, the former Miss Jane Oehler of Buffalo, is now visiting her father, Arthur Oehler in that city. The following appeared on 6 January 1944 in The Evening Leader: An eight-and-a-half pound son was born January 5 to Pharmacist's Mate Second Class and Mrs. Arthur M. Lamb in New York City. The son has been named Ronald, the child's grandfather, O. E. Lamb, 274 Bridge street, was informed. Mrs. Lamb is the former Jane Oehler of Buffalo. Pharmacist's Made Lamb is now stationed at Bayonne, N. J., with the Coast Guard. 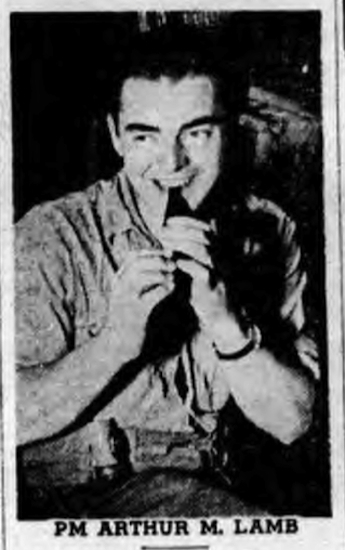 The following appeared on 28 February 1945 in The Evening Leader: Coast Guardsman Arthur M. Lamb, pharmacist's mate second class of Corning is serving aboard a Coast Guard-manned troop transport en route from Italy to Brazil. The ship, which carries reinforcements to combat areas across the Atlantic, returns with injured Brazilian soldiers. Ph. M. Lamb, son of Oliver E. Lamb, 274 Bridge street, has been making voyages to Italy and Brazil since last November. He enlisted in the Coast Guard in September 1942 and was first sent to Detroit, Mich., for training. Following his training in Detroit he was stationed on Staten Island and at one time was aboard a Coast Guard cutter which guarded the Normandie while it was undergoing repairs following the fire which gutted it. For several months previous to being assigned to sea duty, Ph. M. Lamb was stationed on Manhattan Island. His wife, the former Miss Jane Oehler, and their son, Ronald, now reside in Buffalo with her father. Ph. M. Lamb, a graduate of the University of Buffalo, was a pharmacist at Lamb's Pharmacy before joining the Coast Guard. He and his wife formerly lived at 206 East Second street. The following appeared on 8 September 1949 in The Evening Leader: (Corning) The 24th annual Lamb family reunion was held in Denison Park recently with 78 persons in attendance. O. E. Lamb of Corning was named president and Lorain C. Lamb, Corning, honorary president. Other officers are: Arthur Lamb, Corning, vice president. . . Attending were: . . . Mr. and Mrs. Arthur M. Lamb and children, Ronald and Carole. . . The following appeared on 17 May 1950 in The Evening Leader: (Corning) Hospital Discharges, Tuesday the 16th -- . . . Mrs. Arthur M. Lamb and infant daughter, 274 Bridge Street. Jane Ursula Oehler became a widow at his death. Arthur Martin Lamb died on 4 January 1998 at age 80 in Polk County, Florida. The following appeared on 14 September 2002 in The Buffalo News: Jane O. Lamb, 85, of Getzville, who helped her husband run a pharmacy in Corning, died Wednesday (Sept. 11, 2002) in the Rosa Coplon Jewish Home on the Weinberg Campus in Getzville after a long illness. Born Jane Oehler in Buffalo, she lived in the Buffalo area until 1945. She attended Bennett High School, where she was tennis champion in 1926. After high school, she attended Bryant & Stratton for two years. Mrs. Lamb moved to Corning in 1945, two years after she married Arthur M. Lamb. They opened Lamb's Pharmacy in Corning. Mrs. Lamb worked behind the counter and did bookkeeping and accounting tasks. They retired in the late 1960s because of her husband's health and moved to Williamsport, Pa., where their younger daughter lived. In 1997, Mrs. Lamb and her husband moved from Williamsport to Babson Park, Fla. They lived there until January 1998, when Lamb died. The couple had been married for 55 years. Mrs. Lamb moved to the Weinberg Campus in 1998. She was a member of the Home Bureau in Corning. Survivors include two daughters, Carol L. Schultz of Williamsport and Shari L. Gaskell of New Zealand; a son, Ronald P. of East Aurora; three grandchildren; and two great-grandchildren. A memorial service will be scheduled. Burial will be in Florida.